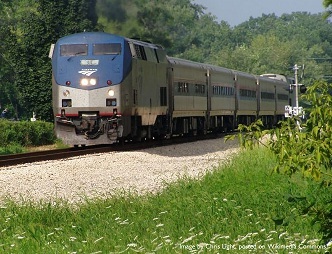 Amtrak currently has two routes which service the Indianapolis-Chicago corridor: The Cardinal, which operates between New York and Chicago, runs three times a week with round-trip service available twice weekly; The Hoosier State, traveling between Indianapolis and Chicago, offers daily service in both directions. Congressional Action requires states to support "corridor trains" of less than 750 miles beginning on October 1, 2013. The Hoosier State is a corridor train. On December 19, 2012, the Tippecanoe County Area Plan Commission approved by voice vote the request by Executive Director Sallie Fahey to begin the process of working on a study with funds from the Indiana Department of Transportation (INDOT). Fahey reported that Indiana State Representative Randy Truitt requested that the Area Plan Commission staff be the local agency to help monitor the study. INDOT has indicated it would provide $100,000 for the study. Those funds would come to Tippecanoe County and be accepted and authorized by the County Commissioners and County Council in that order. With approval of those governmental bodies, the APC staff would then seek a consultant who would be doing the study (presumably with assistance of the APC staff and a group of "stakeholders" which has been forming an Advisory Group). Fahey referred to the following possible considerations for retention of The Hoosier State: importance to Purdue University students (for connectivity to Chicago and Indianapolis), economic development along the route, environmental advantages of rail service and, related, possible relief of some congestion on I-65. Fahey also mentioned that the study could raise the question of greater frequency of trains as well. The lowest number dollars recently mentioned in discussion with AMTRAK has been $3.6 million ($3 million for operations and $600,000 for capital expenses). Fahey reported that she has requested a counterpart in the Indianapolis Metropolitan Planning Organization (MPO) and someone from the northwestern part of the state and someone from the town of Dyer to help with an Advisory Committee which already exists. Fahey also indicated that her staff would need about $16,000 for the staff time which APC would devote to this study. John Thomas would likely be the APC staff person designated to work most closely on this project. Lafayette City Councilor Steve Meyer and Joe Krause, Amtrak Volunteer and member of the Indiana High Speed Rail Association, each spoke briefly in favor of having the Area Plan Commission supporting cooperation with Representative Truitt and the Indiana Department of Transportation. Channel l8 TV News showed a brief interview with Sallie Fahey following the meeting. Information courtesy of Joe Krause; Amtrak image via Chris Light on Wikimedia Commons.